The GOP refuses to talk about the Supreme Court at the RNC. The Supreme Court is the most important issue of the election for Republicans. So they’re not talking about it. Judge Garland—like a bad smell—doesn’t even warrant a mention at the GOP convention. This week, two ghosts have been walking the floor of the Republican National Convention each night after all the hate and fear have been swept up and packed away for the morning. Judge Merrick Garland—whose name is never mentioned—and the perfect amazing nameless nominee Donald Trump will pick to replace Antonin Scalia—an undefined specter more real than Judge Garland. Both are entirely absent from the proceeding’s discussions, yet ever present in the event’s background. To be sure, the deceased Scalia feels like more of a presence at this carnival of flickering representations than any actual living representative of the courts or the judicial branch. Say what you will about the GOP convention but when Twilight Sparkle is getting more airtime than Judge Garland, it’s clear that while the idea of the Supreme Court is awfully important to Republican voters, the reality of it is just another empty symbol. As all these ghosts of absent jurists have haunted the room, Republicans in the Senate celebrated a rather remarkable achievement in historic inaction. 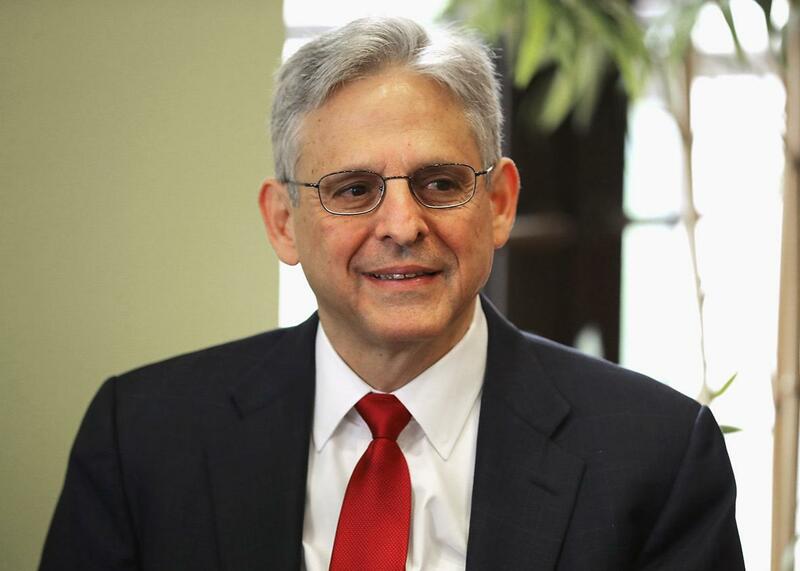 This week, Garland surpassed Louis Brandeis’ record for the most days elapsed between nomination to fill a Supreme Court vacancy and a Senate hearing. It was 159 days ago that Justice Scalia died and 127 days ago that President Obama named Garland as his selected replacement. Brandeis waited only 125 days to get a hearing. But in keeping with their pattern of unerring disrespect and contempt directed at a well-qualified and highly admired public servant, Republicans at the convention have not even acknowledged the ongoing vacancy on the court that is at this point entirely of their making. Beyond the persistent prime-time claims that the court is the most important issue in the 2016 election lurks the empty rhetoric of future judicial vacancies and the insistence that Justice Scalia’s seat is an entitlement, theirs in perpetuity. And Garland—like a bad smell—doesn’t even warrant a mention. In keeping with the broad themes of the RNC, there was nothing more to do about the dubious distinction of allowing Garland to surpass Brandeis in wait time than to brag about the rudeness, the pretexts, and the entitlement. Senate Majority Leader Mitch McConnell did this on Tuesday with tremendous pride, abandoning all previous high-minded rhetoric about “lame-duck presidents” and “letting the people decide.” Instead, he boasted about how early he had planned the total obstruction of whomever Obama would nominate: “And on that sad day when we lost Justice Scalia, I made another pledge that Obama would not fill his seat. That honor will go to Donald Trump next year.” The candor in this admission is refreshing. What McConnell is finally saying aloud is that Scalia’s seat is his to fill; not the president’s. He made a “pledge” after all. But why stop at calling it Justice Scalia’s seat in perpetuity? Maybe we should leave it empty and dedicate it to Harlan F. Stone, whose seat it was from 1925–41? But in addition to the ghosts of justices past, there are a few other apparitions haunting the convention hall this week—the ghosts of justices future. These are the spectral figures Trump named as his potential Scalia replacements last spring, one of whom has openly mocked him on Twitter and another of whom didn’t even know he was being vetted. Trump was quick to note that the list was just “a guide.” He was just spitballing and others might be on the real eventual list. These are the Sacred New Scalias who float above the GOP convention; unnamed but revered in their inchoate but promised Scalia-ish-ness. Over and over again Republicans say that—with a vacancy, an 83-year-old, and two almost 80-year-olds at the court—the selection of new justices is the single most important issue of this election. Clearly it is an issue of such broad, vague, unspecified significance that nobody needs to talk about it. In a sense it is fitting, as Christian Schneider observed in USA Today on Thursday, that the most important person at the GOP Convention is the “secret, unknown man or woman out there who is profoundly affecting the presidential race… [a] person [who] is so unknown, he or she doesn’t even know they are altering the course of American politics.” The whole convention is in thrall to a false promise. Trump has before mentioned that he believes justices “sign bills” and that his SCOTUS picks should principally be the sort who would investigate Hillary Clinton’s emails. (It should go without saying that Supreme Court justices do neither of these things.) His most coherent recent plan for Supreme Court jurisprudence is this: “If I win the presidency, we will swamp Justice Ginsburg with real judges and real legal opinions!” But Republicans remain so certain that the court represents such a vital priority that the actual details of filling the vacancy need not be parsed aloud. So the living breathing Judge Merrick Garland remains invisible while the cult of the so-called Scalia Seat rises in its stead. Open obstruction of the judicial branch is the subject of boasting, and the rule of law ducks in briefly for a Salem-style witch trial conducted by Chris Christie. To the extent the U.S. justice system has been on display this week in Cleveland, it has been the stuff of banana republics and feral mobs. Law and the courts are simply a lever of power with no intrinsic value or meaning. In a campaign about nothing, the discussion about the future of the court is an echo at the empty center.